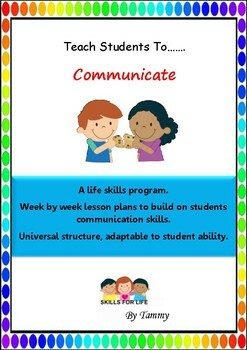 A complete week by week life skills program building on students communication skills. An adaptable program of 1 hour weekly lessons, more than 10 weekly lessons available, so could be used as a term or unit of work. Adaptable to student ability. 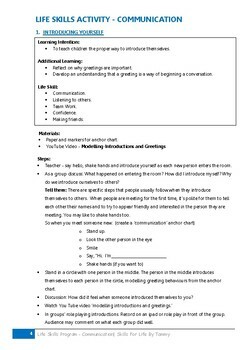 This topic focuses on improving communication skills of students. Communication skills include verbal, body language, posture and facial expressions. 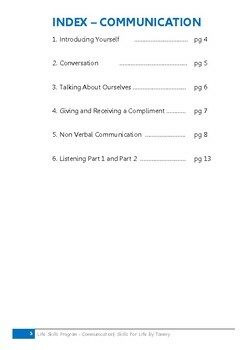 Lessons include, how to introduce yourself, understanding that conversation is back and forth between people, practicing listening during conversations, being able to talk about yourself, beginning to use compliments in everyday conversations and developing the ability to accept praise. If you like this program, check out others in the same collection, including, teamwork, community & emotional intelligence to name a few.